ZION, Roger Herschel, a Representative from Indiana; born in Escanaba, Delta County, Mich., September 17, 1921; attended public schools in Evansville, Ind., and Milwaukee, Wis.; B.A., University of Wisconsin, Madison, Wis., 1943; attended Harvard Graduate School of Business Administration, 1944-1945; served in the United States Navy, 1943-1946, in the Asiatic-Pacific area and was discharged a lieutenant; became associated with Mead, Johnson & Co., eventually becoming director of training and professional relations, 1946-1965; elected as a Republican to the Ninetieth and to the three succeeding Congresses (January 3, 1967-January 3, 1975); unsuccessful candidate for reelection in 1974 to the Ninety-fourth Congress; president, Resources Development Inc., Washington, D.C.; is a resident of Washington, D.C.
Papers: 1966-1974, 76 boxes. The papers of Roger Herschel Zion document his service as a U.S. Representative, particularly constituent correspondence concerning abortion, civil rights, busing, environmental protection, inflation, firearms control, crime, impeachment of Richard Nixon, seating of Adam Clayton Powell, and other political and social issues; correspondence and papers relating to the Vietnam War, including antiwar protests, My Lai massacre, American prisoners of war, and Zion's trip to Paris with other congressmen to discuss with the North Vietnamese the release of American prisoners; correspondence and papers relating to federal legislation, programs, and agencies, including programs relating to railroads, mining, trucking, agriculture, flood control, improvements to Wabash Valley watershed, revenue sharing, Medicare, Alaska pipeline, natural defense, work of departments of Health, Education, and Welfare, and Housing and Urban Development, and work programs such as Manpower Administration, Job Corps, and Office of Economic Opportunity; correspondence regarding constituent requests and problems; campaign papers, including information on contributions; newsletters; and recommendations for positions. A finding aid is available in the repository. Zion, Roger H. The Hallowed Howls of Congress. Indianapolis, IN: Guild Press of Indiana, 1994. Ralph Nader Congress Project. 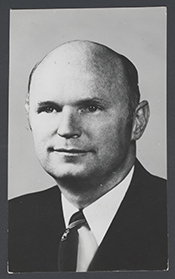 Citizens Look at Congress: Roger H. Zion, Republican Representative from Indiana. Washington, D. C.: Grossman Publishers, 1972.